Pilates is an excellent exercise option during pregnancy as it is great at building core strength. If your abdominals, back, and pelvic floor/Kegel muscles are toned, they will support a more comfortable pregnancy and delivery. This series of exercises is done sitting on the mat and is mostly used for the third trimester client. Intersperse the exercises with lots of deep abdominal breathing and end the class with a relaxation and visualization. Some exercises may be done in a long sit position. Lying on the back after the third month requires an instructor to be aware of how the client is feeling. There may be a possibility of compressing the inferior vena cava, which in turn may compromise the return of circulation of the upper extremities. If this happens, the client may feel among other symptoms, light headed, short of breath, and a quickening of the heart rate. Roll on to the side if you experience any discomfort. Warm-up should be included with proper breathing and stretching. In order to add on to calmness and serenity, you can light candles, turn the lights down and play appropriate music to really enhance the relaxation mode. This exercise opens up the ribcage and stretches the intercostal muscles. Sit crossed leg on the mat and extend the arms out of the side. Inhale to lift the arms out of the side. Exhale to flex to the side bending the underneath elbow for support. Inhale into the ribcage to stretch the intercostals. Inhale to return to the starting position. Good to stretch the spine and the obliques. Sit crossed leg on the mat expand the arms out to the side. Inhale to lift the arms out to the side. Exhale and rotate the torso looking over one shoulder. Exhale to relax into the stretch. Exhale to repeat the other side. 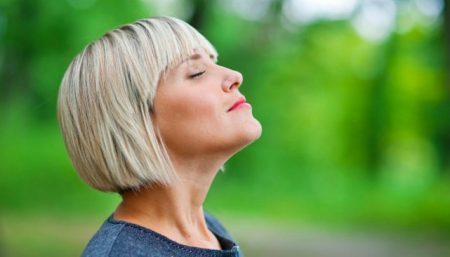 The following exercise aids in relaxation by loosening the neck, throat, tongue and jaw. An open throat is an open birth canal. Sit crossed legged on the mat and lengthen through the spine. Inhale. Exhale and drop the chin to the chest keeping the spine lifted. Inhale to look over the right shoulder, keeping the jaw and tongue relaxed. Exhale to look towards the left shoulder. Exhale to drop the chin back to the chest. Repeat several times on one side and then reverse it. Hip Opener : Loosens the hips and stretches the adductors. Sitting crossed legged on the mat, pick up one leg and cradle the knee and ankle with the hands. Inhale the carry the leg across the body. Allow the leg to relax into the hands. Exhale and open the leg to the side, relaxing in the hip socket. Repeat several times before pulling the leg towards the chest to stretch the gluts. Bridging on the Ball Adds strength to the torso and legs. Also, adds Stability to the spine and pelvis. Lie on the floor with the heels on the ball. Legs are straight. Exhale and slightly tilt the pelvis and lift the pelvis off the floor. Inhale to return to starting position. Pel vic Circle on the Ball– Helps in releasing tension in the pelvic area. Lie on the floor with feet on the ball knees bent. Forward Kneeling Stretch: This exercise opens up the pelvic diameter, stretches the pelvic floor muscles and the lower back. Sit back on the heels with knees apart the feet together. Lean forward in to the ball supporting the arms or head. Thigh Stretch It stretches the front body. Kneel and place the ball under the head and shoulder. Exhale and lift the pelvis of the heels. Hold or come down on the inhale. Kneeling Cat Stretch An excellent warm up and stretch for the spine. Strengthens the core muscles also tones pelvic floor. Kneel facing the ball with bath hands on the ball. Inhale. Exhale and roll down the spine pressing the ball away. Inhale to extend to neutral spine. Exhale to press the hips back towards the heels; this will stretch the pelvic floor. Exhale to roll up the spine. Back Stretch – This exercise releases and opens the spine. Walk the feet forward while relaxing the spine into the ball. When ready lower the head onto the ball. Extend the arms overhead, out of the sides or on the abdominals. Keep the knees bent for a less intense stretch the legs if it is comfortable. Check with your doctor or midwife before starting these exercise. If you have never done Pilates before, it will be important for you to find a pre-natal Pilates class, or an instructor who can give you a lot of one on one attention. It is not recommended that you begin doing Pilates on your own if you haven’t already worked with the fundamentals.